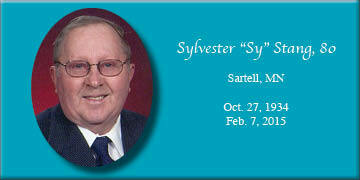 Sylvester “Sy” John Stang, 80, of Sartell, died Feb. 7, 2015. His funeral was held Feb. 11 in St. Francis Xavier Catholic Church Sartell. The Rev. Eb Schefers officiated and burial was in the parish cemetery. Stang was born on Oct. 27, 1934. He was the 10th of 11 children born to Magdalena (Rassier) and Joseph F. Stang at the St. Cloud Hospital. He was a proud graduate of Cathedral High School. He served in the 101st Airborne Division of U.S. Army. Stang married Catherine F. Tourand, known as Kay, on Sept. 13, 1975. He was employed by DeZurik Corp. for 36 years and retired in 2000. He enjoyed dance roller skating, pool, football, softball, volleyball, horse shoes, bowling and golf. He along with nine friends created Pine Edge Sportsmen Inc., where many still enjoy softball. Stang had a special talent for organizing sports leagues. He was a charter member of St. Francis Xavier Church , a charter member of the Knights of Columbus Bishop Trobec Council #5276 and a member of the Granite City Machinists and Mechanics’ Union for 50 years. Survivors include his wife of 39 years; sisters: Valeria Kraemer, Josephine Meyer, Marie Janssen, Caroline Trautz and Dolores Crowell; four brothers-in-law; five sisters-in-law; and many nieces and nephews. He was preceded in death by his five brothers, Victor, Roman, Alphonse, Wilfred and infant brother, Leo. Thank you to the St. Cloud Hospital caregivers for your awesome kindness. Arrangements were entrusted to the Williams Dingmann Family Funeral Home in Sauk Rapids. Obituary and guest book are available online at: www.williamsdingmann.com.